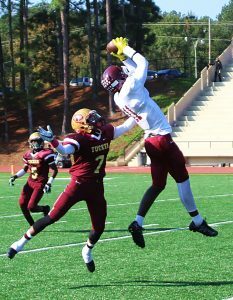 Latavious Johnson rushed for 147 yards and three touchdowns to lead the Tucker Tigers to a 38-6 victory over the Bethune Lions for the DeKalb County Trail to the Title Middle School Football Championship on Saturday at Godfrey Stadium. The championship was Tucker’s second in five consecutive trips (2013-2017) to the title game. The Tigers also went 9-0 in 2013 on the way to the title. It was Bethune’s third trip to the title game without a victory with the last trip coming in 2011 as the Lions fell to 8-1 on the season. Tucker scored to go up 6-0 on the game’s opening drive as Johnson carried the ball four times for all 65 yards in the drive including the final 38 for the touchdown with 6:20 to play in the first quarter. The Tigers’ defense held the Lions and a short punt set up a short field for the Tigers’ offense at the Bethune 26. Five plays later Johnson went the final 10 yards with 51 seconds left in the first quarter to make it a 12-0 lead for the Tigers. Bethune answered on the following possession driving 65 yards with aid of Rashod Dubinion two-yard run to convert a fourth and two at the Tiger 39. Jahbari Cleckley finished off the drive hitting Jamel Nelson for a 22-yard touchdown pass to cut the with 5:38 left in the first half to cut the lead to 12-6. The Lions held the Tigers and began a drive reaching the Tiger 39 before three consecutive penalties pushed Bethune back to its own 35 where the punter entered the game to kick away to Tucker. The two teams went to the half with Tucker leading 12-6. Tucker stopped the Lions second half opening drive and following the punt had the ball at their own 48. Johnson took the handoff on the first play and wound his way through the Lions’ defense for a 52-yard touchdown run to make it 18-6 with 6:03 left in the third quarter. On Bethune’s next possession Cleckley was hit as he threw a pass and the ball fell into the arms of Tucker defensive lineman Kaece Supples at the Bethune 42 for the interception. Three plays later Omari Gordon raced 38 yards for the touchdown and 24-0 Tiger lead with 3:22 left in the third quarter. Bethune would use the rest of the third quarter as a 12-play drive begin at the Lion’s 40. 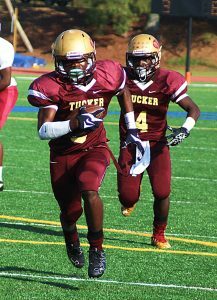 Cleckley hit Jiniran Bonner for 17 and 15 yards on consecutive plays to move to the Tucker 26. Tucker put the Lions in a fourth and 15 and needing to try for the first down. Dubinion threw over the middle to Nelson for 24 yards to the Tucker 5 and threatening to score as the third quarter ended. The Tigers’ defense had a tackle for a loss and forced an incomplete pass on fourth and goal to prevent Bethune from scoring. Gordon struck again for the Tigers with 1:15 to play as he went 36 yards for a score. Maddox Lyerla added the extra point for a 31-6 Tucker lead. The Lions weren’t going to quit, but a deep pass over the middle was intercepted by Johnson and returned 56 yards for the final score of the game with 1:01 to play. Lyerla’s point after was good to make the final margin of 38-6. Tucker did not throw a pass in the game and rushed for 287 yards on 27 carries and five touchdowns. Latavious Johnson had 11 carries for 147 yards and three touchdowns to go with his 56-yard pick-six to earn the game’s Most Valuable Player Award. Omari Gordon added a seven-carry, 87-yard and two touchdown performance in the game. Defensive lineman Kaece Supples had several tackles and an interception to earn the game’s Defensive MVP award. Bethune’s Jiniran Bonner had five receptions for 62 yards to earn the Offensive MVP honors. Tucker became the fourth program to get two championship trophies joining Stephenson (5), Miller Grove (3) and Cedar Grove (2). The Tigers are 42-3 in their five-year run of reaching the championship game, including 30-0 in regular season play.